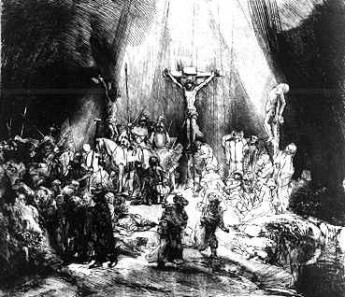 The Three Crosses (1653) is an etching by Rembrandt van Rijn. The artist was known as much for his printmaking as his painting. The etching was reworked at least four times by Rembrandt; this is an early version. The print measures 37.5 x 45 cm (15 x 18 in) and is part of the collection of the British Museum, London.